The seven dollars I invested in an "obstructed view" ticket to Thursday's Homecoming: An Evening with Virgil T. concert at Helzberg Hall might be the best money I've spent all year. Although Virgil Thomson is Kansas City's best known classical composer, I'm only familiar with his score for The River. A learned gentleman of my acquaintance repeatedly referred to the event as a tribute to Aaron Copland. Thomson has become a stranger in his own home town. That's one reason the event was significant. The other was the inspired collection of local musicians assembled by Nathan Granner. *Mezzo-soprano Elaine Fox's vocals on William Blake's The Tiger! were enthralling. *Two selections from the opera Four Saints in Three Acts floored me. I'm deeply embarrassed by my ignorance of this work. *Given my predilections, it's not surprising that The People's Liberation Big Band's rendition of Overture: The Mother of Us All was my favorite piece of the night. *Shay Estes, an occasional PLBB collaborator, startled me during an appearance by The Monocle. She just keeps getting better. *An unaccompanied solo accordion piece by Kyle Dalquist amazed me. *The concert was filmed for use in a public television documentary about Thomson. Watching annoyed patrons in the good seats shield their eyes from the glare of camera lights amused me. About that obstructed view seat: The piano sounded as if it was coming from the Kauffman Center's lobby. Much of the commentary by Crosby Kemper III and Dr. Andrew Granade was impossible to make out. I would have liked to have heard what Kemper said about a composition titled "Cynthia Kemper: A Fanfare," but his remarks were inaudible. Full when the concert began, about ninety percent of the people in my section didn't return after intermission. About a quarter of the entire audience of approximately 1,200 departed at the same time. 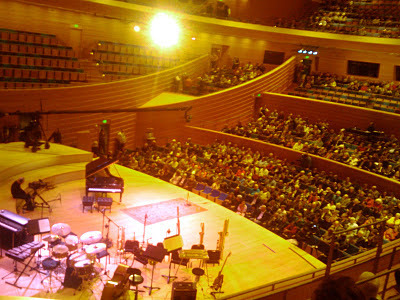 I sat in prime seats during my three previous visits to Helzberg Hall. The sound was perfect. I can now confirm the discontented grumbling I've heard from friends and associates- until corrections are made, the oft-repeated notion that there's no such thing as a bad seat in Helzberg Hall is a fallacy. Even so, I would have paid ten times more for the remarkable experience I enjoyed Thursday. I can no longer deny the genius of Tune-Yards. You can have Mayer Hawthorne and Raphael Saadiq. I choose Jose James. Here's ECM's audio player for Stefano Battaglia Trio's The River of Anyder. This represents my happy place. Spotify tech question- how do I view all available albums by an artist or composer? Sports fans need to hear Billy Bob Thornton's finest moment (not kidding) before the conclusion of the World Series. Blues pianist Earl Gilliam has died. Kansas City Click: My official picks of the week are published here. Thanks for being Nathan Granner.